Sheffield Wednesday came from behind as Barry Bannan's second half-free kick rescued a point for the Owls against Stoke. Gary Rowett's visitors had taken an impressive first-half lead thanks to a Benik Afobe double at Hillsborough, but the spirited hosts struck back through Portuguese striker Marco Matias. Afobe, who took his tally to four for the season, had another goal ruled out for off-side and went close again before Scotland international Bannan clipped in the equaliser off the post. It moved Wednesday up to ninth and meant Potters boss Gary Rowett has still won just one in his last 14 away matches in all competitions. Stoke have the second-worst defence in the Championship so far having conceded 13, only QPR are worse with 14 against, and were once again guilty of sloppy defending in South Yorkshire. With Brentford loanee Ryan Woods impressing on his full debut, and Afobe lively throughout, they should have made the most of going ahead via the DR Congo forward after only two minutes. 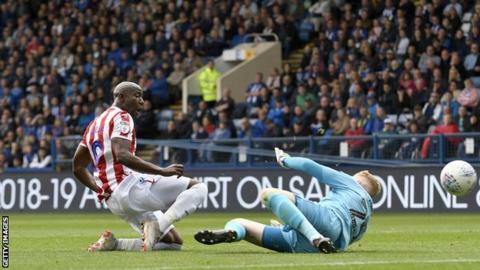 Peter Etebo and Mame Diouf combined to feed Afobe from close range, and he was on target again when the impressive Tom Ince set him free inside the box 20 minutes later. But Jos Luhukay's outfit were not out of it and pulled one back as Matias finished neatly past Jack Butland as the Stoke defence split too easily. Ince went close for the visitors after the break and Diouf had an effort blocked but then Bannan's delicate free-kick set-up a frantic finale. Rowett sent on substitutes Bojan and Darren Fletcher to try and chase all three points, but had to settle for just one as the Owls saw out four added minutes. "It was very hard for us today, when you are 2-0 down it is always very hard but we did well to come back into the game. "We spoke last week (about) how important it is to believe in each other. It looked like we lacked that for 20 to 25 minutes and we had to fight back, but fight back we did. "But in the end, we give our players credit. We are very happy to come away with a point. Character and mentality is so important in the Championship." "For 30 minutes I felt we were in full control of the game and we could have been further ahead. "We then conceded a goal which gave them a huge lift for five to 10 minutes and we lost a bit of intensity. "We created further chances in the second half and I felt we should have won the game comfortably. "It's frustrating when you don't win games. I'm disappointed with the result but pleased with a vastly improved performance." Match ends, Sheffield Wednesday 2, Stoke City 2. Second Half ends, Sheffield Wednesday 2, Stoke City 2. Corner, Sheffield Wednesday. Conceded by Erik Pieters. Substitution, Sheffield Wednesday. Michael Hector replaces Adam Reach. Matt Penney (Sheffield Wednesday) wins a free kick in the attacking half. Substitution, Stoke City. Darren Fletcher replaces Peter Etebo. Goal! Sheffield Wednesday 2, Stoke City 2. Barry Bannan (Sheffield Wednesday) from a free kick with a left footed shot to the top right corner. Attempt saved. Matt Penney (Sheffield Wednesday) left footed shot from the left side of the box is saved in the bottom right corner. Assisted by Atdhe Nuhiu. Offside, Stoke City. Joe Allen tries a through ball, but Benik Afobe is caught offside. Attempt saved. Ryan Shawcross (Stoke City) header from the centre of the box is saved in the centre of the goal. Assisted by Joe Allen with a cross. Substitution, Sheffield Wednesday. Josh Onomah replaces Marco Matias. Substitution, Sheffield Wednesday. Atdhe Nuhiu replaces Joey Pelupessy. Attempt blocked. Mame Biram Diouf (Stoke City) right footed shot from the centre of the box is blocked. Assisted by Peter Etebo. Corner, Stoke City. Conceded by Jordan Thorniley. Attempt missed. Peter Etebo (Stoke City) right footed shot from outside the box is close, but misses to the right. Assisted by Erik Pieters. Attempt saved. Peter Etebo (Stoke City) left footed shot from a difficult angle on the left is saved in the bottom left corner. Corner, Stoke City. Conceded by Cameron Dawson.